Day Five at the 2019 505 Worlds. The sea breeze was already in as we moved onto the course and the 505 fleet was making good time up to the race area. Racing started at 1100 hrs with a breeze of 9 knots and out of the south west. 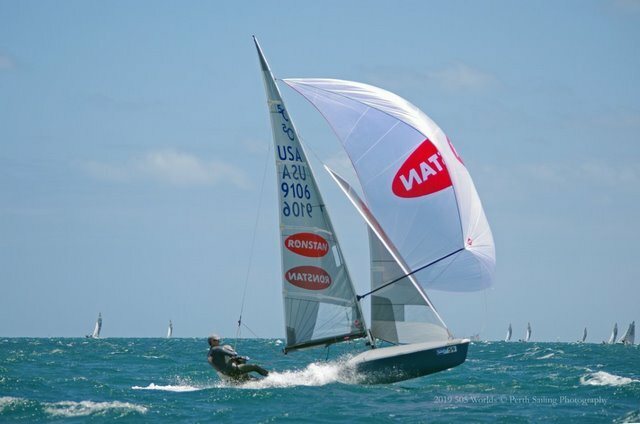 USA’s Mike Martin and crew Adam Lowry had elected not to sail today as their lead was unassailable and that opened up the scoring for the rest of the fleet. To dispel any doubts about the fact that wing marks were a novelty, PRO Robyn Olsen gave us another one this morning. 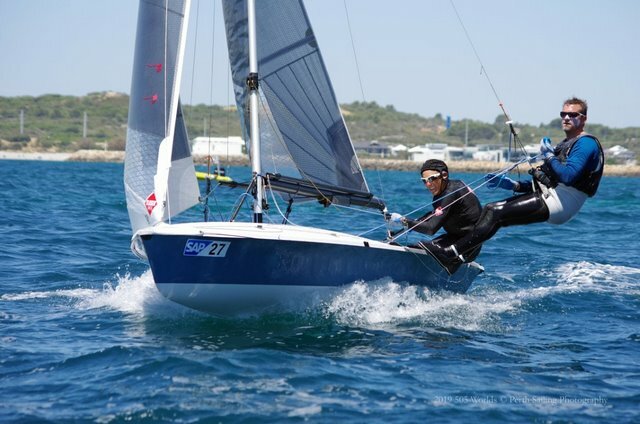 The rather surprised Aussie pair Daniel Keys and Daryl Roos looked back at the top mark and found out that they were first. 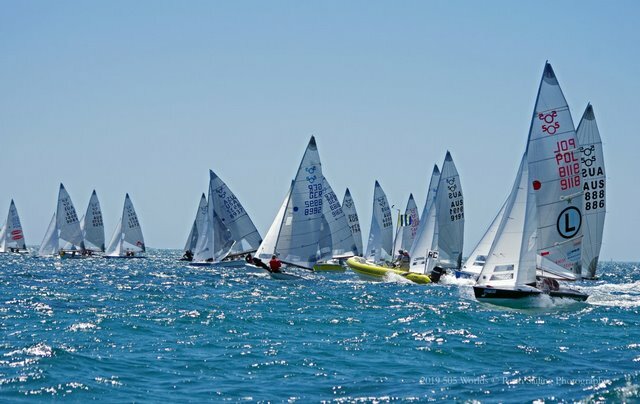 By the time that the fleet had returned to the top again, sailing became a dash to the wing when the breeze suddenly strengthened and yesterday’s last race winners, Jan Saugman and Marcus Cooper found themselves well to the fore and rounding the wing first. Close behind them were the South African team of James Largier and Richard Hutton-Squire with West Australians Peter Nicholas and Luke Payne trying to pass them. It didn’t happen and that was the order over the line for the finish. 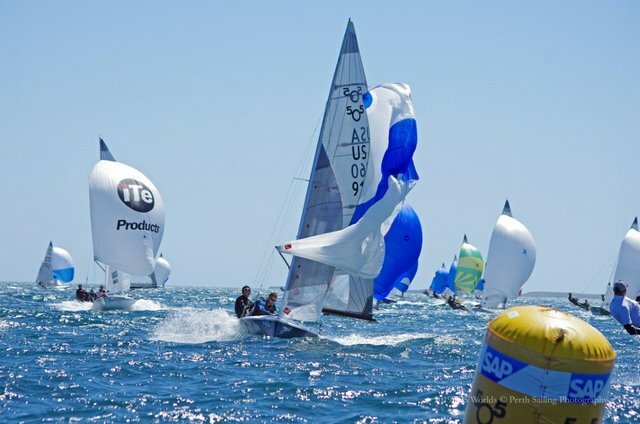 The second race was a traditional 2 lap windward–leeward that started out at 1.3 nm and as the breeze grew, found itself extending out to 1.5 nm for the last lap. West Australians Pete Nicholas and Luke Payne were relishing the burgeoning breezes. Staying up right and ahead of Julian Steuckl and Johannes Tellen was all that was required of them. 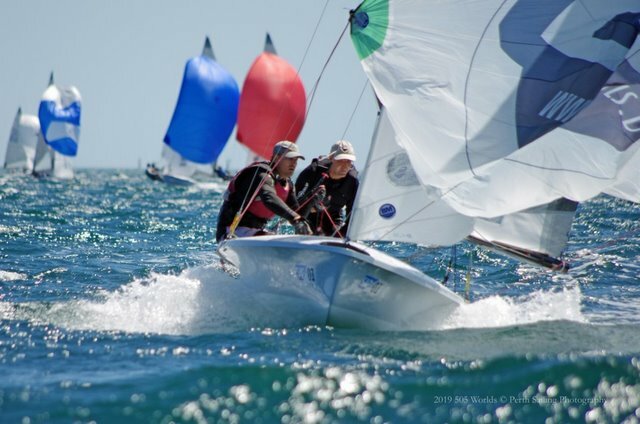 In third place Mike Holt and Carl Smit of the USA had had a good race and had ensured second place in the world championships ahead of fellow Americans Parker Shinn and Eric Anderson. The 2019 505 Worlds were an all American affair this year with Mike Martin and Adam Lowry taking the win with a nett of 24. In second place Mike Holt and Carl Smit showed that consistency will get you a long way (nett 38) and Parker Shinn and Eric Anderson were working very hard to beat their fellow Americans and managed to snaffle third place with a nett of 42. 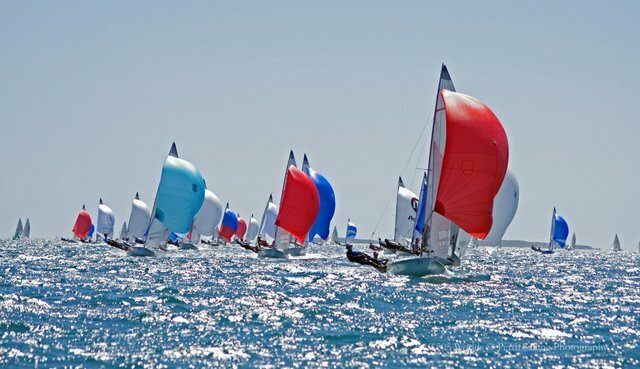 Standout sailing over the regatta, where do we begin? The Americans really showed us how it’s done and they covered it in both light and heavy breezes. The German crews were pushing all the time and would have been happier with the lighter breezes, but still showed their commitment. The local boys and girls really played their part. 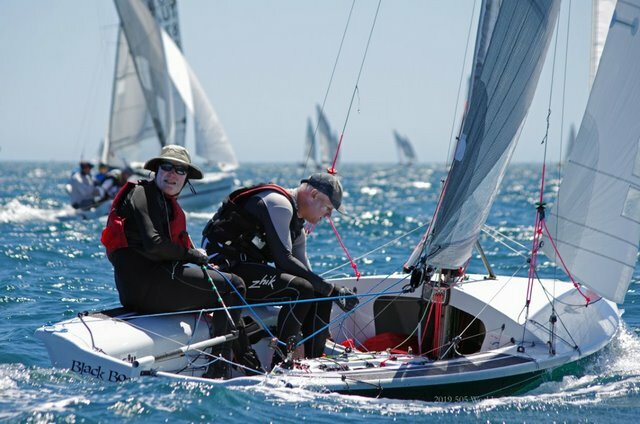 From the senior members through to the 125 sailors who have stepped up, they worked to keep their boats going and the way they generally handled the conditions was a credit to them. 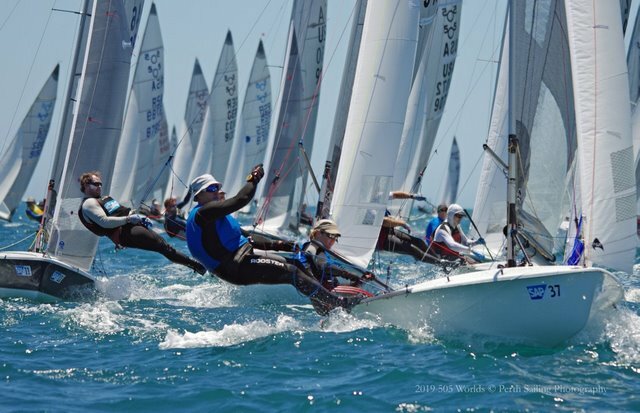 The 2019 Worlds regatta was sailed in testing conditions for the first three days and then champagne sailing for the next two days. Light to moderate breezes and an easy swell made it great sailing through out the fleet on Sunday and Monday. 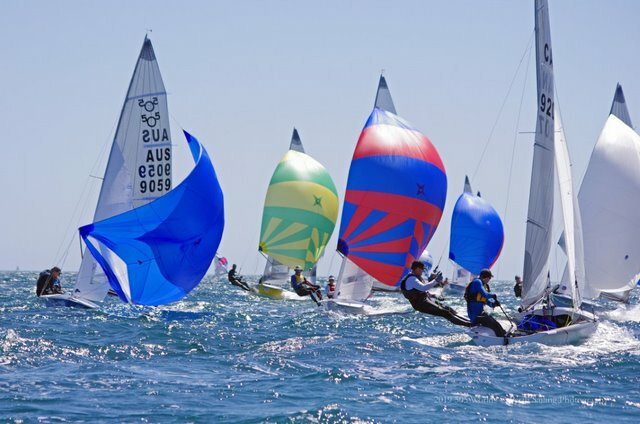 Fremantle Sailing Club and their race teams of volunteers helped by the FSC staff, kept the regatta moving and fed well. The morning coffee stall was very much appreciated by all, as was the work by the canteen ladies who fed the masses with the help of the clubs cheerful bosons who grilled and cooked every day. Farewell from the water off Fremantle where the Doctor resides.